With an attention-grabbing tagline, “All the sugar and twice the caffeine,” JOLT Cola burst onto the consumer product scene in the mid-1980s. Fortunately, or unfortunately depending on how one feels about highly caffeinated, sugary, carbonated beverages, JOLT Cola is no more. But, for we capital market types, there remains, another more important JOLT, and recently that JOLT has been packing more of a punch than JOLT Cola ever did. Every month, the Bureau of Labor Statistics compiles the Jobs Openings and Labor Turnover Survey (i.e. JOLTS). The JOLTS program queries 16,000 private nonfarm businesses and government entities in the 50 states and the District of Columbia on timely employment topics, including job openings, hires, and layoffs. The data is compiled and analyzed to help us better understand the state of the labor market. And the survey result that commands the most media and investor attention is the jobs opening data that helps determine the spread between the number of Americans out of work and actively seeking a job and the number of available jobs. January of this year marked the 11th consecutive month where job openings outnumbered job seekers. More specifically, openings exceeded the number of Americans looking for work by more than 1 million. 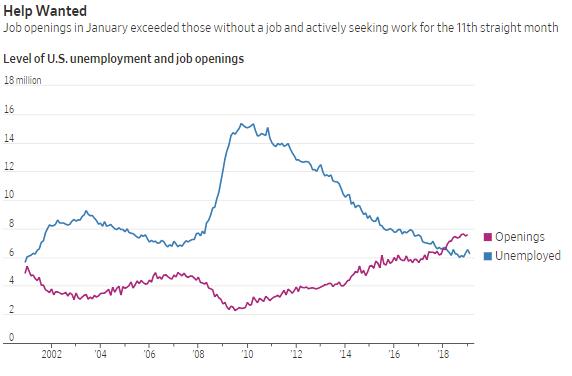 Today’s job market stands in sharp contrast to what the country experienced in 2009 when nearly 16 million Americans were seeking a job and companies and government entities had only two million positions to fill, see the chart below. Said plainly, there are more help wanted signs hanging in windows across this country than there are Americans looking for work. We are all likely living through the strongest jobs market in our respective lifetime. All of this is very good news for the American worker. But, as we highlighted last week, a real risk for the markets and the economy is that a too tight jobs market sparks wage inflation and pulls the Federal Reserve, so recently moved to the sidelines, back into the game of raising rates.